What a Fabulous Vintage Set just perfect for that special occasion, especially for a Bride at her Wedding or Gift! It just oozes that Vintage Glamour and is without doubt a necklace and earring set of the highest quality dating to between the 1910s and 30s when delicate, lacy jewellery was so popular – its condition is near new. Although it is unmarked I have no doubt these stones are Swarovski crystals or similar due to their outstanding Quality, Sparkle and Clarity which my pictures do no justice. It is comprised of clear and sparkling genuine prong-set crystals in white Gold Filled settings which is probably finished with Rhodium for a glossy sheen. 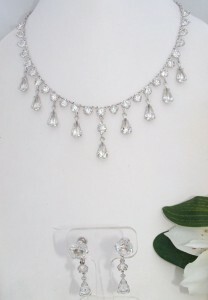 The design is so simple yet so elegant - an array of round and tear drop facet cut crystals in four claw settings in a festoon or draping style. Further crystals extend part way along the rope chain necklace. Please view the pictures for the best description of the design and styling but they do not do it justice whatsoever. The balance of the chain is a rope link finished with a bolt/spring clasp. The screw-back earrings are a perfect match with their round and tear drop crystals, and if preferred, the screw-backs could be replaced with ear wires easily. Near Mint Antique/Vintage condition! Apart from a teeny spot of wear to an earring’s metal curve, I cannot fault it. The stones & finish is bright and sparkling and without flaws. This Quality-made necklace & earrings set is certain to please the MOST fastidious of purchaser and would be perfect with that special outfit or as Wedding jewellery. Destined to become a special heirloom keepsake!